Lightweight, easy to pull around. Vacuums floors very well. Love the included tools! This is my 4th Miele vacuum cleaner in 34 years! They are the best, last forever, strong motor! I now have many friends using Miele! - Comes with Miele SBB300-3 Parquet Floor Brush - Designed to go flat under baseboards, low under furniture, tight up against kick jams and around chair legs. With a 90 degree twisting rotation there not many places this floor brush can't go! The Miele C3 Series A perfect synergy of design and functionality, Miele's C3 series sets new standards in floor care. Superior engineering is balanced with carefully-selected, fine quality materials such as a durable stainless steel wand and specialized ABS plastic with a hard, impact-resistant surface. The C3 series features innovative skeleton construction, making it 2 lbs. less than the S5 series. Other conveniences include a 36-foot operating radius and foot pedal controls for quick and effective cleaning. C3 also features a silence motor to maintain a quiet environment, and an AirClean Sealed System that not only vacuums your floors - but also cleans the air your family breathes. The Parquet Floor Brush is ideal for all smooth flooring such as wood or tile. The Miele Calima comes with the STB 305-3 Turbobrush which is activated by the suction of the machine and its rotating roller brush loosens the dirt and sweeps up fluff and hair! A telescopic, stainless steel wand and long electrical cord, with one-touch automatic rewind, provide a total cleaning radius of 36 feet. Other conveniences include three integrated accessories - a dusting brush, upholstery tool and crevice nozzle - and a 3D bumper. Excellent Vacuum - exactly what I wanted! This vacuum is everything I was looking for. It's lightweight, powerful, easy to maneuver and easy to store. The cord is very long and the canister has protective bumpers keep walls and mouldings safe. All the tools fit inside. The floor brush is slim to fit under furniture and couches. It's gentle on wood floors. The upholstery tool works wonderfully on my couches. I had a Dyson Animal prior to this. Although it cleaned well, it was too heavy and bulky. As well as difficult to use when cleaning stairs or the hose tool. I love this new Miele. I owned a 12 year old Miele, but the cord mechanism broke. Initially I was a little skeptical because this new Miele was lighter and felt less durable. Using it for a week now, I love it. It is easier to maneuver than the old one, yet it has the same cleaning power than the old one. I love the brushes designed for carpet and wood floor specifically. I only like canister vacuum cleaners because of their versatility. This vacuum is wonderful. It is more quiet than any of my previous vacuum cleaners. The suction is fabulous. The attachments stay on! (I had issues with previous vacuum cleaners.) I also love the fact that there are two filters and the allergen bag . I've had many,many vacuums over the years. This is by far the best For wood floors and dog hair. I love that's it's light weight and has all the attachments stored right in the canister. Excellent suction worth every penny. great purchase , no complains. better cleaning and better maneuverability than a dyson. I only wish the power button did not automatically turn on when connecting it to power supply. I love this item its powerful, does everything I'd expect . Not too noisy strong suction would purchase it again. Very nice does cleaning at a fast paste such a great tool . Never mind the cost it's worthy of the price. 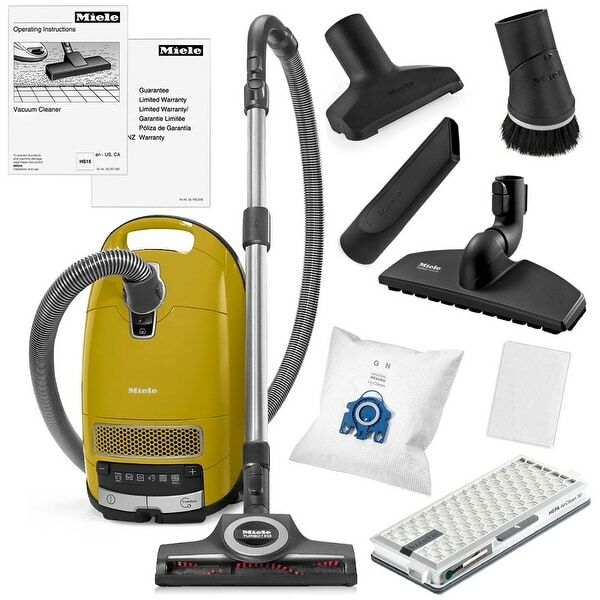 This vacuum is amazing, and the Overstock price is the best out there! Just assembled my new vacuum and it seems to be working excellently. Easy to assemble and easy to operate and light weight. It has great suction but the attachments are wimpy.